Keeping fit and having fun with the kids is something I try to tie together as often as I can. It takes a lot of discipline to make sure that I get adequate exercise so that I will be closer to my fitness goal. Now at 38 I am more aware of the importance of being healthy so that I will be free of major ailments and complications in the future. The kids really need me to be fit and there for them more now than before as they grow up into young adults. I am seeing many of my friends who are around my age start suffering from various health issues due to the sedentary lifestyle that a lot of us have. ( No exception for me too). The instant lifestyle that we have ( instant foods, outsourcing of almost everything possible) has made me more lax. There are lesser opportunities and reasons to do physical exercise. Sometimes I really wish that there is a quick fix and that all the excess fats that I have accumulated from childbirth and not having a regular exercise would just magically disappear. I do know that it is not possible having tried many ways to reduce the baby weight and get back to the shape and weight that I was when I was in my 20s. The only way possible moving forward would be for me to be disciplined and have a change in my lifestyle incorporating the proper nutrients, exercise and habits. The kids are now at the ages where they can try out lots of fun and dare-devil activities. I want to be there to experience it alongside with them when they have their first experiences and the only way that I can do that is to keep myself fit and healthy. I’ve just embarked on a new challenge to keep fit and lose weight and have started to see results in. I’ll be starting up a new series on this block documenting my journey to fitness entitled – “Finding A New Me”. Do look out for the posts starting 1st week of October. 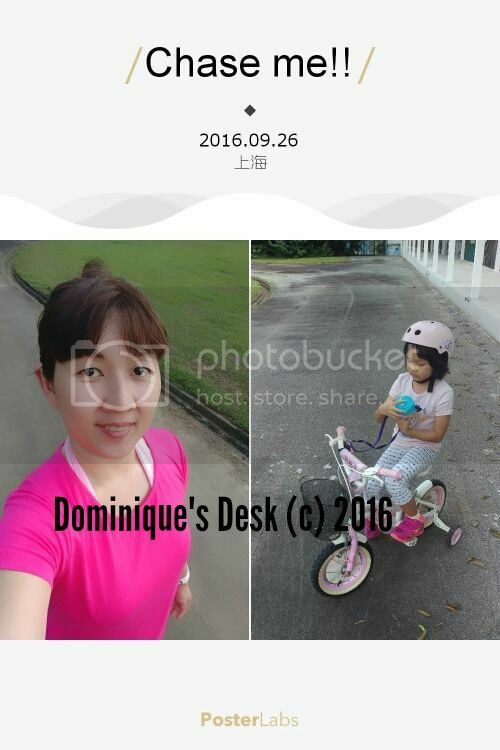 Do you exercise with your kids too? Yeah I agree sis! Mommies should always be fit and healthy kasi kawawa ang family natin pag tayo ay hindi healthy wala ng mag aalaga sa mga anak natin. Exercise and lifestyle is one factor. Good luck on your health goals. It gets harder and harder as we get older for sure! Looks like your latest adventure was fun though. I love her pink bicycle, and all her pink clothes!! I was doing really well, then got off track. I need to step up my game! Keeping healthy is very important. It is so easy to slip and let things go. Good on you for getting on to it. Great idea exercising with the kids. I recently took my nieces to a National Park for a swim. I just watched them exercise while I relaxed. I didn’t enough running around with them playing tiggy. We were exercising but stopped when we caught coughs and colds a few weeks ago and hasn’t gone back since. Oh how much do we need to exercise.